a limited space or plane surface. association a's areas of the cerebral cortex (excluding primary areas) connected with each other and with the neothalamus; they are responsible for higher mental and emotional processes, including memory, learning, speech, and the interpretation of sensations. Area. Functional areas and lobes of the cerebrum. auditory a's two contiguous areas of the temporal lobe in the region of the anterior transverse temporal gyrus, known as the primary and secondary auditory areas. Called also acoustic areas. Broca's motor speech area an area comprising parts of the opercular and triangular portions of the inferior frontal gyrus; injury to this area may result in motor aphasia. Broca's parolfactory area a small area of cortex on the medial surface of each cerebral hemisphere, between the anterior and posterior parolfactory sulci. Called also area subcallosa. Brodmann's a's specific occipital and preoccipital areas of the cerebral cortex, distinguished by differences in the arrangement of their six cellular layers, and identified by numbering each area. They are considered to be the seat of specific functions of the brain. 1. the geographical region drained by one body of water. 2. the area whose residents are served by a specialized health care agency. Called also catchment. embryonic area (germinal area) (area germinati´va) embryonic disk. Kiesselbach's area an area on the anterior part of the nasal septum, richly supplied with capillaries, and a common site of epistaxis (nosebleed). language area any nerve center of the cerebral cortex, usually in the dominant hemisphere, controlling the understanding or use of language. motor area any area of the cerebral cortex primarily involved in stimulating muscle contractions; most are in the precentral gyri. See also premotor area, sensorimotor area, and Broca's motor speech area. motor speech area see Broca's motor speech area and Wernicke's area. occupational performance a's categories of activities that make up an individual's occupational performance; they include activities of daily living, work activities, and play or leisure activities. A delay in any of these areas may be addressed by occupational therapy intervention. 1. a general area of the brain, including the olfactory bulb, tract, and trigone, the anterior portion of the gyrus cinguli, and the uncus. postcentral area (postrolandic area) an area just posterior to the central sulcus of the cerebral hemisphere that is the primary receiving area for general sensations. precentral area primary somatomotor area. premotor area an area of the motor cortex of the frontal lobe immediately in front of the precentral gyrus. primary area areas of the cerebral cortex comprising the motor and sensory regions. primary receiving a's the areas of the cerebral cortex that receive the thalamic projections of the primary sensory modalities such as vision, hearing, and smell. Called also sensory areas. primary somatomotor area an area in the posterior part of the frontal lobe just anterior to the central sulcus; different regions control motor activity of specific parts of the body. Called also precentral area and rolandic area. projection a's those areas of the cerebral cortex that receive the most direct projection of the sensory systems of the body. rolandic area primary somatomotor area. sensorimotor area the cortex of the precentral and postcentral gyri, which are the motor area and the primary receiving area for general sensations, respectively. sensory a's primary receiving areas. sensory association area an association area around the borders of a primary receiving area, where sensory stimuli are interpreted. silent area an area of the brain in which pathologic conditions may occur without producing symptoms. 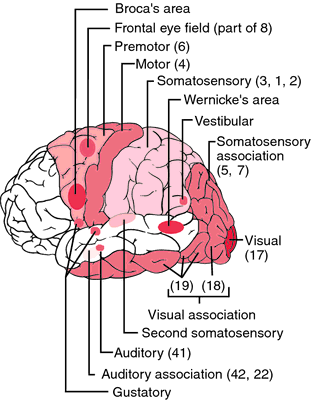 somatic sensory area (somatosensory area) either of two cortical projection areas in or near the postcentral gyrus where conscious perception of somatic sensations occurs, known as the first or primary somatosensory area and the second or secondary somatosensory area. area subcallo´sa (subcallosal area) Broca's parolfactory area. area under the curve (AUC) the area enclosed between the curve of a probability with nonnegative values and the axis of the quality being measured; of the total area under a curve, the proportion that falls between two given points on the curve defines a probability density function. visual a's three areas (first, second, and third visual areas) of the visual cortex. The first visual area is better known as the striate cortex. Wernicke's area originally a name for a speech center thought to be confined to the posterior part of the superior temporal gyrus next to the transverse temporal gyri; the term now refers to a wider zone that also includes the supramarginal and angular gyri. the geographic jurisdiction of a community mental health center; its boundaries delimit the population of people who qualify for mental health services provided by that particular center. 1. The area drained by a river or body of water. Also called catchment basin. 2. The surrounding area served by an institution, such as a hospital or school. the specific geographic area for which a particular institution, especially a mental health center, is responsible. Medtalk A region served by a health care facility or health plan, and delineated by population distribution, geography, or transportation patterns. See Demographics. Geographic jurisdiction of a community mental health center; its boundaries delimit the population of people who qualify for mental health services provided by that particular center. the region from which the data in a particular study are drawn. The method presented here is sufficiently flexible and versatile to be applied to any health care market, however, so although it has been tested using NHS data it should be equally applicable in other health economies, all of which depend on catchment area definitions for service planning and analysis. Re-infiltration of different mines on the Puhajogi River catchment area may vary, it will not exceed 25% (together with groundwater) . But homes in the catchment areas of good schools are not always more expensive, with property close to Little Leigh Primary in Northwich, Cheshire, ranked 32nd, selling for 29pc less than homes in the surrounding area. But they want to ensure that pupils from Marlborough Primary - and catchment area schools - do get places. The mother of three girls aged 18, 15 and 11 lives in the Victoria Park area of Cardiff and successfully got them into Radnor Primary, although she lives in the Lansdowne Primary catchment area. Parents set for sacrifice as school catchment is king; Some parents in Wales are selling up and paying an average PS12,296 more for new homes to get their child in to their preferred school catchment. Abbie Wightwick reports.. The cabinet decided not to make a commitment to merging catchment areas in all Warwickshire towns by 2016. Location within the most popular schools' catchment area added 19 per cent to the cost of the house. SIR; Your feature on Waitrose in last week's issue rightly based its analysis on details about the relative affluence of households in catchment areas. But now Liam is settling in to Downfield Primary after his parents, Derek and Carol, sold their home and moved 600 yards, into the school's catchment area. With our new center, businesses in the Memphis catchment area now have new competitive sourcing options for a wide range of materials via CN - the rail industry's service and efficiency leader - and its partners in the Memphis-area trucking industry. The stunning three-bedroom bungalow in Houndsfield Lane is beautifully presented and situated in the ever popular Tudor Grange Academy catchment area, surrounded by open countryside. Many families will lease their existing home and rent a house in a specific school catchment area while waiting/ looking for a house to buy and being able to move permanently.